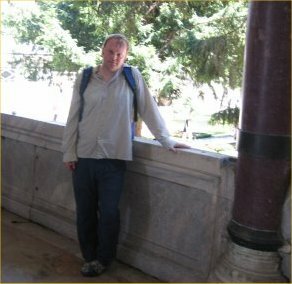 Adventure and a “proper” holiday in Istanbul (2/2). 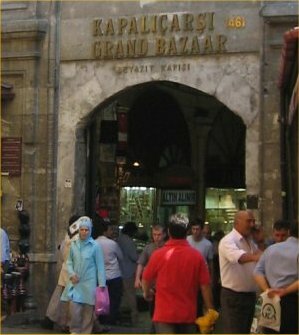 We visit the Grand Bazaar.To describe this as a market, is to do it a disservice. 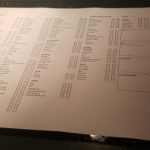 The sheer size of it, is awesome. Its so big inside, that there really is no point in trying to navigate, getting lost is almost guaranteed. One of the main walkways into the centre of the market.I remember watching a horror film some years ago. Post apocalypse, some people setup home in a large shopping centre, where everything they need is available. If you were locked in, it would take you a lifetime, to eat, drink wear etc. just a small percentage of goods in here. I had been told that the shopkeepers could become annoying, although I never saw this. They were persistent, but always polite and obviously masters of the selling art. 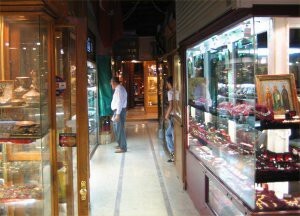 There were many different sections of the Bazaar, and an entire section devoted to Jewellery .Sarah bought a bracelet here. 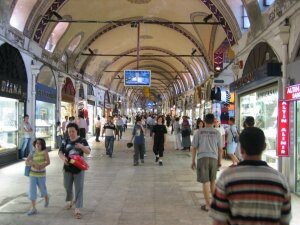 Haggling across the floor of the market, is considered poor form. The famous Valens aqueduct built in the 4th century, which carried water from the Belgrade Forest.It was only replaced by a modern water distribution network, in early 1900. 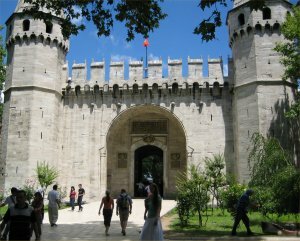 The main entrance to the Topkapi Palace.One of the things that amuse me, is that the more I travel, the more I find original buildings, which were the names of restaurants in my home town. Standing on one of the many spectacular balconies near the Baghdad Pavilion.The area has beautiful white and blue tile work, and was constructed in 1639 to celebrate the capture of Baghdad. 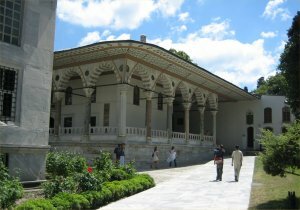 It was nice being in the shade, as the weather on that day was very hot even for Istanbul. 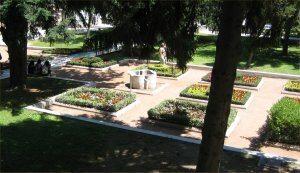 The gardens were beautiful to walk around.It was very relaxing to be immersed in an environment, like this. The throne room.There were literally hundreds of buildings like this, located all over the palace. It would be a feat to build the palace with modern mechanical assistance, let alone ordinary people carrying rocks by hand. 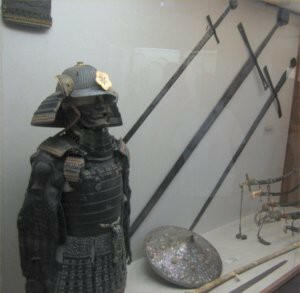 In a building which was originally the inner treasury, is a small museum of armaments.An 8 foot long sword would have been used European crusaders. I am not sure how people managed to fight with a sword that big !. The armour is 15th Century Ottoman. My favourite place in the whole Palace, was the balcony next to the Konyalti Restaurant overlooking the Bospherous.On such a beautiful day, it will be one of my main memories of the trip. 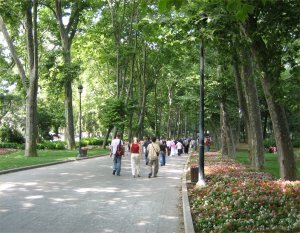 One morning we decided to go for a walk through the Gulhane park, in the centre of the city.The sound of birds, and the smell of plants and grass had an immediate effect on me, I don’t like to be away from the countryside for long. 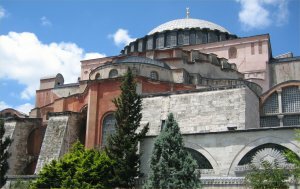 The Church of Holy Wisdom aka Haghia Sophia.More than 1400 years old, it is among the worlds greatest architectural achievements. 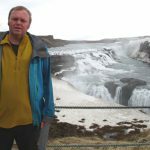 If you have ever tried to construct an igloo, or some other kind of self supporting shelter (ok, I confess, I have) you will realize the complexity. Imagine trying to do that, with what was then the largest dome in existence, even today, the 4th largest religious dome in the world. To support such a large dome, the building has been buttressed on several sides, which gives it a “rounder” shape. 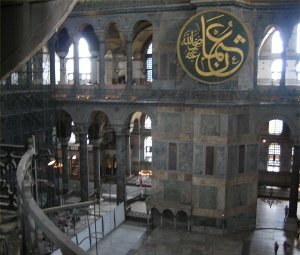 Originally inaugurated as a Church in 537, it was later converted into a Mosque by the Ottomans in the 15th century.Its for this reason, that the building contains artefacts from both the Christian and Muslim religions. Naive of me perhaps, but I wonder if a holy place where both religions could pray side by side, might be the key to peace one day. Invading countries and blowing up subways, doesn’t seem to be achieving much. The centre off the building (the Nave) was designed to impart a celestial feel, and it certainly did that for me. 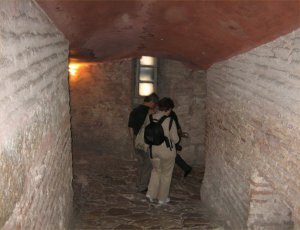 One of several walkways, leading to the upper floor.100 stonemasons, and 10,000 labourers, were required to complete it. 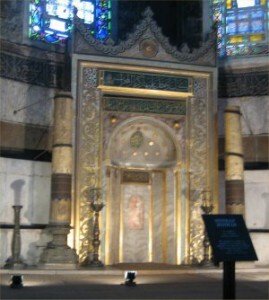 As the building has been used as both a Mosque and a Church, it features a Mihrab which points in the direction of Mecca. 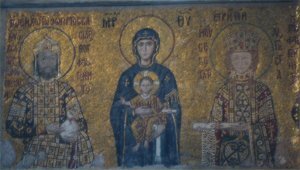 A Christian structure, actually stood on this site from the 3rd century, but was destroyed, rebuilt and then destroyed again before becoming the Haghia Sophia.One of many beautiful Mosaics showing the Virgin Mary, Jesus, Emperor John II and Empress Irene. 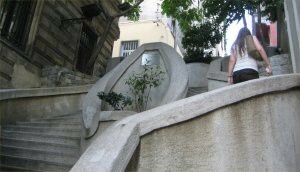 We decided to spend our last day in Beyoglu, on the opposite side of the Golden Horn.We got a bit lost, but a friendly stranger, who spoke perfect English gave us directions, and showed us this hidden gem of a staircase near St. Mary Draperis Church. We continued up the hill, navigating through back streets, and passed the British Embassy. 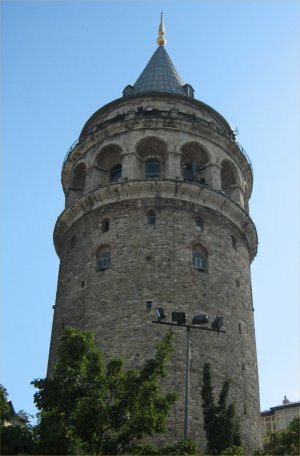 At the top of the hill in Beyoglu we reach the Galata tower which at 62 meter’s high, is visible from all over Istanbul.Built in 1348 it was originally used as a watch tower. 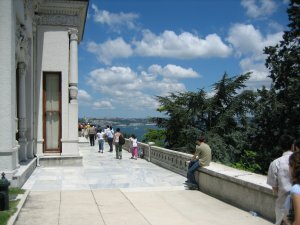 Its now a wine bar and nightclub with spectacular views of the whole of Istanbul the Bospherous. 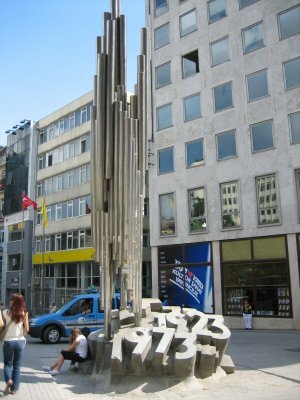 We wandered along Istiklal Caddesi, Istanbul’s busiest street, where trams still run to this day.I discovered this Memorial but have been unable to find out its name or what its supposed to commemorate. At a guess, 1923 is when Istanbul was declared a republic, and 1973 would have been its 50th anniversary, so I presume its to commemorate that. 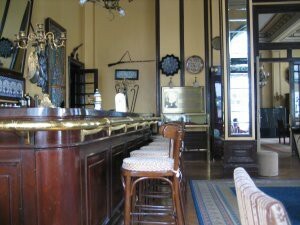 The afternoon before we head home, we decided to go somewhere nice, and have a few drinks.The famous Pera Palace Hotel was built in 1892. It featured in Murder on the Orient express, written by Agatha Christy. The room she stayed in is kept on show for guests to view, exactly as it was. 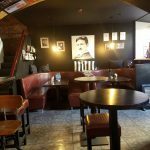 Originally guests on the Orient express were transferred to the hotel, on chairs carried by waiters (its a long walk up hill, to get to it).